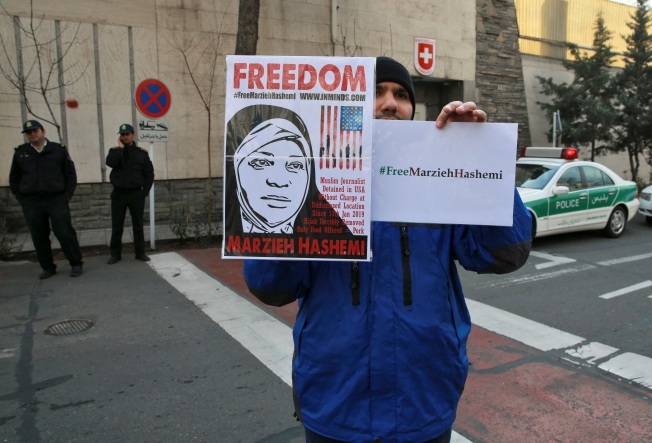 A man attends a demonstration in front of the Swiss Embassy, which oversees U.S. interests in Iran, to protest the detention in the U.S of Marzieh Hashemi, an American-born anchorwoman who works for the Iranian state television, Press TV, Sunday, Jan. 20, 2019. A prominent American-born anchorwoman on Iranian state television who was held in the U.S. as a material witness was released from jail Wednesday evening. He didn't immediately respond to a call seeking comment on Wednesday.